By the Governor. A Proclamation for a Publick Thanksgiving. Boston: Draper, 1773. 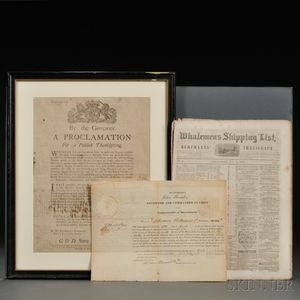 Broadside, ESTC lists three copies in American libraries, two at the American Antiquarian Society, and one at the Massachusetts Historical Society, with a note on the back from a Reverend Smith of Weymouth, framed; and a collection of papers and ephemera, including three issues of the Whalemen's Shipping List from 1853 and a few odd pages, and other documents.